When you stop to consider the health benefits of sewing skills, you may find that sewing is one of the best hobbies anyone could take up. 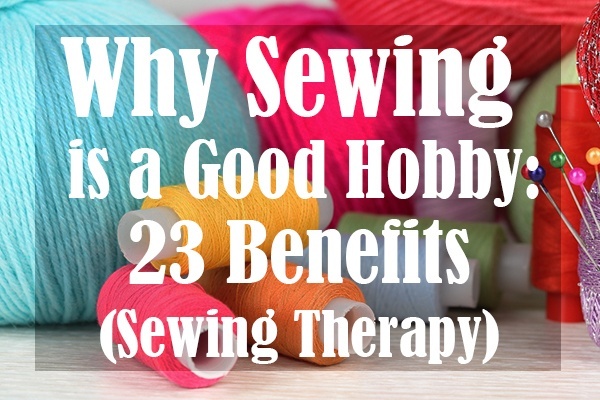 Today, we’re going to list the various benefits people who regularly sew get to enjoy. So without further ado, let’s talk about some advantages of having such a creative hobby. Even if you’re only just learning how to sew, you’ll find that there are plenty of ways you can make use of your newly-acquired knowledge. Here are just a few of the ways knowing how to sew would benefit you. For one, sewing lets us make alterations to the clothes we already own. Isn’t it just so annoying how certain brands’ clothes look completely amazing in their ads and just plain wrong on our own bodies? Well, we’ll share a little secret with you: all of the clothes in fashion brand ads are altered to the model’s body. So why not ensure that your clothes are looking just as good on you? Pants that are a bit loose at the waist can be easily taken in, and we might also be able to expand a too-tight skirt. Just slip a little extra fabric in the sides and you’ll have a completely original piece. Making alterations doesn’t need to be a strictly practical event. In fact, we all bring our personal style to the table by choosing to insert a particular pattern or color of fabric or choosing a matching or contrasting thread. Even vintage clothing can be spruced up once in a while. You can take that old blouse from the ‘80s, take out the shoulder pads, and take some of the material off the shoulder to make it more appropriate for today. Moreover, you’ll also be able to alter new clothes. If you find yourself rolling every new pair of pants up or getting them hemmed, knowing how to sew could make your life a bit easier. After all, it only takes a few minutes to hem or alter a piece of clothing. Obviously, making your own clothes or refashioning old styles is a sure-fire way to keep from overtaxing your credit cards. Who needs a whole new wardrobe every season, anyway? Upcycling is certainly better for the planet, not to mention cheaper. Even buying fabric and thread to sew your own clothes is cheaper than buying fast fashion. And, who knows, maybe your designs are going to become the big trend of the season. As we’ve already stated, one of the reasons why you might want to recycle old items of clothing at all is to lessen your own environmental impact. After seeing the 2015 documentary The True Cost, we’ve realized how devastating an impact fast fashion has on our planet. If we want to improve, we must start by decreasing our own consumption. Actually, making your own clothes will make you feel at least a bit more connected to them. After all, you’ll know exactly where each of the items you’re wearing came from. So you’ll be a bit more sure that no one was hurt in the process of making your clothes. Additionally, one of the greatest benefits of sewing skills is that they allow us to have an outlet for our creativity. We get to choose everything about the pieces we make, from the fabric and thread to the style, and even down to the buttons or zippers. Once you get the hang of sewing, you can take a bigger part in the design itself. Creating a sewing pattern is actually easier than you might think. Soon enough, you’ll be able to make your wildest ideas come to life. That’s a lot of creative freedom most of us don’t typically get at our day jobs. That is exactly why sewing is such a great hobby. The best thing about having a creative hobby is the rush you get out of seeing the result of your work! Whether you’ve made a blouse for yourself or a personalized gift for a friend, the completion of the task feels beyond amazing. And then, there’s the additional feeling of self-satisfaction we tend to get when we see that we’ve given someone the perfect gift. What’s more, if you also want to practice being a Good Samaritan, you can make clothing for charities. If someone is already down on their luck, they’re bound to appreciate getting brand new homemade clothing. On the other hand, if you simply don’t feel like doing something for nothing, or at least don’t want to give your pieces away to just anyone, you can also open a shop. Plenty of people sell their items on various social media sites, although you could also open up an Etsy shop or even sell your clothes on eBay. And, who knows — you might even turn your hobby into a job one day! One of the best benefits of sewing skills is that they help you develop better self-discipline. Especially if you have a day job, sewing is a hobby you’ll need to find time for. You may start waking up earlier or even experience a surprising energy boost in the evening. Because you know you’ll have your sewing to get back to when you get home from work, you’ll have something to look forward to. 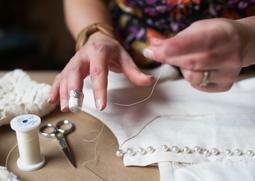 What’s more, sewing can keep your day on track even if you don’t have a traditional job. Finally, another great thing about sewing as a hobby is that so many people are ready to help you on your journey! 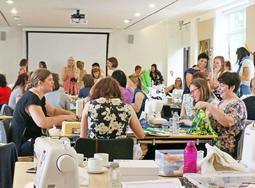 The internet is full to the brim of sewing forums for a whole range of different categories. 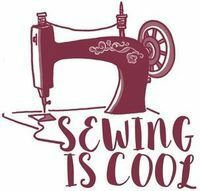 There are sewing communities that focus on vintage or historically accurate clothing, cosplay communities, and many others. And if you’re unable to find exactly what you’re looking for, you can always start a new group, online or in real life. 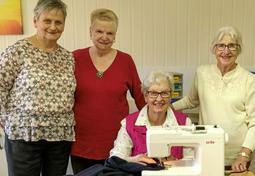 We recommend heading to a local community center and trying to schedule a weekly sewing circle. You can print out a few ads and mention the group to a few of your friends in the neighborhood. In no time at all, you’ll have a room full of people who are excited to talk about sewing with you. Now, we can move on to the health benefits of sewing skills. However, most of them are in some way connected to the benefits we’ve already discussed. After all, having a supportive community has been proven to increase our overall happiness, which leads to positive psychological changes. Furthermore, there are plenty of physical benefits of sewing skills we’ll list, too! So let’s see what they are. When it comes to the physical benefits of sewing, it’s all about the position you’re doing it in. So not everyone is going to experience these health improvements. Still, if you’re sitting straight while you’re working, these are some of the physical changes you can expect. Hand-eye coordination is important not only for our cognitive development but also for our physical well-being. Because sewing involves cutting along straight and curved lines and managing fabric while the machine is working, your spatial perception is bound to improve. Additionally, if you’re hand sewing something, you’d be forced to be even more in tune with your work. Most of us have found that hunching over is somewhat difficult when we’re sitting at a sewing machine. However, that’s not to say that it can’t be done. We recommend using your time at the sewing machine to practice proper posture. Sitting upright will also help any back pain and headaches you get as a result of tension. These are some of the more useful health benefits of sewing skills because proper posture will carry over into other tasks. So you’ll find yourself sitting and standing upright more often overall. Obviously, having to use your fingers in any capacity will make your hands stronger. But it’s not only a matter of improving hand-eye coordination. In fact, people who are suffering from arthritis have also found sewing soothing because the repetitive motions soften the joints over time. Additionally, you can expect to see an increase in your dexterity as well. The many psychological benefits you receive from taking your time to focus and meditate as you sew are truly plentiful. However, they’re not only mental. Indeed, our psychological state greatly affects our physical health as well. Time and time again, we’ve found that people who have sewing as a hobby have lower blood pressure. Something about the repetitive movements and sounds seems to lull us in just the right way. Also because of the various mental health benefits of sewing skills, people tend to generally notice an increase in their daily energy levels. Naturally, that leads to much better mood overall, which we can then use to do more sewing. Clearly, it’s a win-win situation! When you’re happier and your body has more energy, you’ll also feel much stronger overall. In turn, that leads to a stronger immune system, which helps you fight off disease and viruses. So, we can see how sewing can actually make you healthier in a very real way — by keeping you from getting sick in the first place. On top of the many physical health benefits of sewing skills, there are also plenty of ways sewing occupational therapy can improve our lives. For those who aren’t in the know, occupational therapy means using certain activities to improve physical or mental health. Some of the types of occupational therapy programs that exist involve art and various crafts, like woodwork. For all of the reasons we’ve listed above and more, sewing occupational therapy is a very useful way to help people get over various mental health hurdles. Ask any amateur seamstress and she’ll tell you: “Sewing is my therapy”. In fact, many of us feel just the same. As we’ve previously mentioned, the combination of the various stimulants we’re surrounded by and the actions we take while sewing makes the perfect base for total mental relaxation. 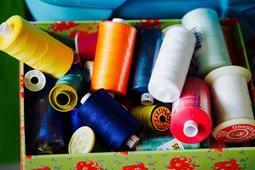 What’s more, we’ve also observed that sewing has helped many people work with their anxiety. Having a project that’s completely under our own control can start to teach us that sometimes, there’s no predicting when something will veer off plan. Therefore, what sewing really teaches us is when to give in. We’re working with machines, thread, and fabric that will eventually let us down. Thread snaps or gets tangled in the machine, and the machine itself can break down one day only to make a miraculous recovery the next. These are the small frustrations every seamstress deals with, but they’re also the things that teach us patience. Once we understand that not everything is under our control, we’ll see a significant increase in happiness. That’s the true therapeutic benefit of sewing skills — knowing when to let go and when to try again. In fact, we believe that the stress relief aspect of sewing is even more apparent to those who practice the therapy of hand sewing. Having to individually cast each stitch becomes akin to meditation. 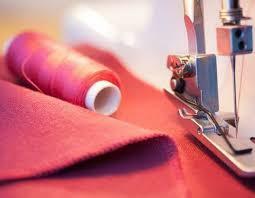 In addition, hand sewing also helps us focus in on a single task, thereby improving our concentration. Because of the inherent unpredictability of sewing, the skill also teaches us how to plan for the random surprises life throws our way. Or, rather than plan for unforeseen circumstances, sewing actually teaches us to improvise. Aside from being able to think on our feet (or in our seats, as it were), sewing also teaches us time and project management. From start to finish, sewing projects also require us to rely on our math knowledge to adapt patterns. And you’ll develop an even sharper focus if you’re practicing the therapy of hand sewing. Best of all, our newly sharpened problem-solving skills transfer into other aspects of our lives as well. Because sewing improves our dexterity and focus, evidence also suggests that people who sew experience dementia and age-related brain deterioration to a much lower degree. After all, the brain is an organ like any other. If you don’t use it and challenge it often, it will waste away naturally. Sewing provides the perfect way to exercise our brain a little bit. Between the math and the project organization, this hobby can easily become our lifeline. If you’re already experiencing some memory loss, you can start by writing down your plans for a particular piece. Eventually, you’ll find that you’re able to remember more things, especially as you start to care about your sewing accomplishments more. Another one of the psychological benefits of sewing skills is that it brings about a greater self-confidence. We believe that would be a useful trait for all women to have, don’t you? Typically, as our sewing skills improve, so does the overall quality of our projects. The feeling of accomplishment is almost a drug. But, the thing that will really boost your self-esteem is the mere knowledge that your hands can create something that’s not only beautiful but also useful. We’ve seen it happen a million times with people who practice creative skills. However, we’d go as far as to say that no other creative hobby feels as fulfilling, precisely because we get to wear the fruit of our labor. But, now that we’ve expounded on the physical and mental health benefits of sewing skills, it’s time to consider the various advantages of teaching kids how to sew. So let’s get into it. Despite the involvement of needles, let us begin by saying that sewing is actually a perfectly safe hobby — even for kids! If you’re not convinced, we’ll just point out that sewing machines for kids exist, and leave it at that. In fact, kids can reap many of the same benefits of sewing skills as adults do. Furthermore, while sewing only allows us to sharpen those skills, kids are only just learning about some of them. We also have some tips for parents who are looking to teach their kids how to sew. If you want to teach your kid some basic stitches and how the sewing machine works, you may use scraps of fabric. After all, that’s how most of us start sewing, too! And, once you’re confident that your child can handle a bit more responsibility, you can let them choose from a few of your own shirts, and have their first project be altering your clothes to fit them! 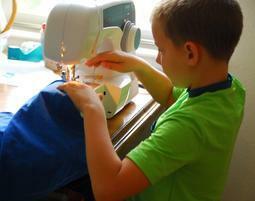 You’ll get to spend quality time with your kid, and they get to work on their sewing skills. Another win-win! In the same way that sewing can help us preserve hand-eye coordination, it can begin to build it in kids. Having to be precise with their work, cut straight lines (under the supervision of an adult), and gently manipulate fabric will help your child mature faster than they would’ve otherwise in the best of ways. Overall, kids love when adults let them handle a bit more responsibility. As long as your child is also having fun, learning to sew can only benefit them. Just like adults, kids love to feel the accomplishment that comes from completing a task and doing it well. That’s why we shower them with praise, isn’t it? However, researchers have proven that kids who are praised for hard work, rather than for being smart, tend to do better later in life. Generally, we consider “being smart” as something people are born with, while hard work is something that takes perseverance. Therefore, kids feel a greater sense of accomplishment when we praise them for something that took some effort to complete. That’s why building self-esteem is one of the best benefits of sewing skills for kids. In addition, self-confidence can translate beautifully into schoolwork later on, when your kid understands that only hard work will get them the results they want. So sewing can actually set them up for the rest of their lives if you introduce it correctly. Focus is one of the most difficult skills to nurture in children, especially with all of the distractions we have nowadays. Tracing patterns can teach kids a whole new level of patience. And, if they’re working in a group and sharing supplies, they’ll also need to know how to have the patience for other people, as well. For us, one of the greatest things about sewing is that it’s a great creative outlet. However, though it may not seem like it when our toddlers bring us their wonderfully colorful drawings for appraisal, creativity isn’t something we’re born with. Or, if it is, it also requires a lot of work to nurture and keep. How many adults do you know who seem to have completely lost their creativity over the years? Don’t let that wonder ever escape your child. Show them a new and useful way to channel their creativity. Trust us, your child will thank you when they’re the only one walking into class in an outfit of their own design. Finally, the last of the many benefits of sewing skills in kids would be that they require your kids to practice their social skills, as well. Whether it’s asking for an adult’s help when a machine jams or praising the other kids’ work, sewing can be a wonderfully inclusive hobby. Given enough time, your child will learn the value of kind words, and they’ll be more likely to give them out. Now that we’ve talked about the benefits of sewing skills from various angles, all that’s left to do is spread the news. If you’ve been trying to convince someone to take a sewing class with you, share this article with them. We’re sure they’ll jump on the opportunity to experience all of these perks. As always, if you’ve personally experienced some additional rewards, we invite you to talk about them in the comments down below.